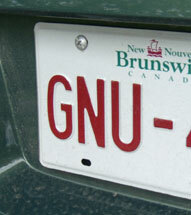 My parents bought a GNU car, and that makes me happy, because I’m a geek. This is the first new car my family’s had in about 12 years. It’s a bit strange driving a small automatic car, whereas before the only choices I had before were large automatic or small manual. Everytime I stop the car I still lift my foot to push down on the emergency brake, as I would in the old van, before I realise where I am. What’s really throwing me off is that the horn is now in the centre of the wheel, and the place where the horn was on the old car is now filled by the cruise control. It’s a little disconcerting to think that just when I’m going to need to slam on the brake and honk the horn, I’ll instead hit the button that automatically accelerates the car up to 110km/h. There was no *thump*, so I may have just missed, but it was definitely a close call. And that harpie Mother Nature’s been messing with me ever since. That same afternoon a dragonfly flew a collision course straight for my crotch before veering off to its left at the last second, and yesterday a hummingbird snuck up on me pretending to be a giangantic killer bee. Let’s not even get into what the spiders have been up to. I think I should start riding my bike more.